Flora Salim is an Associate Professor in the Computer Science and IT department in the School of Science, RMIT University, Melbourne, Australia. 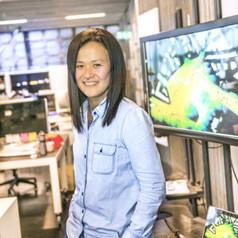 She leads the IoT Analytics group, working on human mobility and behaviour analytics, context and activity recognition, urban computing, and applying machine learning for smart cities and smart buildings. She is a Victoria Fellow 2018, a highly-competitive merit-based award from the Victorian Government. She received the School of Science Executive Dean’s Research Excellence Award in Feb 2019. She is the recipient of the RMIT Award for Research Impact - Technology 2018, and was the recipient of the RMIT Vice-Chancellor's Award for Research Excellence – Early Career Researcher 2016. Previously, she was an Australian Research Council (ARC) Postdoctoral Industry (APDI) Fellow in 2012-2015. Dr. Salim has been awarded two ARC linkage grants, a Discovery, and numerous national and international industry contracts, with the total amount awarded of over than $3M in the last 5 years, in collaboration with Microsoft, IBM, Northrop Grumman Corporations, Arup, City of Melbourne (CoM), Mornington Peninsula Shire (MPS), Siemens, Aurecon, and others. She received her PhD award from Monash University in May 2009. She is an Editorial Board member (Area Editor) of Pervasive and Mobile Computing. She is an Associate Editor of the PACM on Interactive, Mobile, Wearable and Ubiquitous Technologies (IMWUT), the journal publication of Ubicomp. She is an expert member of IEA EBC (International Energy Agency's Energy in Buildings and Communities programme) Annex 79. She recently served as a TPC Vice-Chair of IEEE PerCom 2018 and an expert committee of the JPI Urban Europe and National Natural Science Foundation of China (NSFC) calls on Sustainable and Liveable Cities and Urban Areas. She is a regular reviewer for ACM TOIT, IEEE THMS, IEEE TKDD, IEEE T-ITS, IEEE TSC, IEEE TCC, PMC, and Springer DAMI journal.